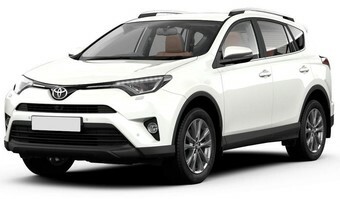 Toyota Rav4 with new body has amazing configuration and external characteristics. Popular off-roader with perfect details is an ultimate choice for adherents of the off-road driving. Toyota Rav4 new 2017 rental in Kiev allows you to see the true value of the novelty and feel you to be a road conqueror. Four-wheel-drive car with the power of 146 h.p. can easily overcome the obstacles while driving in the city. Toyota Rav4 new 2017 in Kiev if available for everyone, who has driver’s license and at least 2 years of experience. With the service of “Rental” company, you get an opportunity to drive a modern car with excellent technical characteristics without losing a pocketful of money. Rental price depends directly on the rental term – the price for long-term services is lowered! Toyota Rav4 new 2017 in Kiev if a right solution if you are looking for a car for long distances. The version with automatic transmission is accommodated with a help system (when driving on hills), multimedia audio system with 4 loudspeakers, heating up and automatic regulation of seats and mirrors. Toyota Rav4 new 2017 in Kiev can let you enjoy the comfortable driving. Each detail is planned and improved in comparison with the previous model. If you are interested in driving functionality, elegancy and safety, you can rent a car in Kiev.